The modern world's obsession with grading and marking art as if such works were merely a page of junior school sums inevitably brings art to the masses as it simultaneously reduces art to the lowest common denominator. Thus, of the top 25 in Channel 4's '100 Greatest Movies Of All-Time' poll (conducted in 2001), only three were made prior to 1950, and just one (Crouching Tiger, Hidden Dragon) was non-English language. What the poll should realistically have been titled was '100 Movies You, Our Audience, Have Heard Of And Think Are Pretty Good'. One even expected to see the overblown (and overlong) Titanic in the list...and one wasn't disappointed, as it clocked in at a respectable number 54, a mere five places higher than the masterpiece A Matter of Life and Death and a clear 30 places ahead of the classic 1938 The Adventures of Robin Hood. Yes, such lists are meant to be a talking point (I'm waiting for the 'Top 50 Surf Bands Ever' to omit the Beach Boys, again just to get people talking), but there is a limit- and the limit has been reached. We've had (courtesy of Channel 4) '100 Greatest War Films', '100 Greatest Musicals', '100 Greatest Movie Stars' and many more- all seemingly doing the same thing: re-cycling clips with a variety of celebs on hand to wax eloquent about the finer points of films like Toy Story (not an easy matter, I grant you). One genuinely wonders what film-related lists have yet to be drawn-up: will we have '100 Greatest Film Haircuts' or '100 Greatest Great Film Characters'? If we do, the same films will most likely be there (again) and the same old people on hand to comment sagely about the "plot" or "the characters" without saying anything too revelatory. In essence, those 'manufacturing' the polls are doing two things- providing material for their audience and also telling the audience what its tastes are. Without being overly snobbish, the majority of the Channel 4 audience who are willing to E-Mail, write, or, even worse, text in to vote for such 'top...' list shows are not likely to cast their precious pearls of wisdom for a film they have only barely heard of, read about or noticed on the 'world cinema' rack in their local HMV. They will stick with the known, the trusted, the familiar. The votes subsequently cast lead to a pecking order which is broadly representative of the audience as a whole, with the occasional interesting abhoration, leading, I am willing to bet, to vast swathes of the audience shrugging their shoulders in bewilderment as an isolated island paradise of a Bergman, Eisenstein or Godard film troubles the crashing wave that is post-1950 Anglo-American cinema which seems to dominate such lists. From the unpromising position of mediocrity overload (which seems to totally ignore that any films were made prior to 1950 (and especially not without sound!) or made anywhere else but Britain and America, it would be tempting (and indeed forgiveable) to dismiss any further intrusions on already over-farmed cinematic land as patently unnecessary. However, the Time Out guide 1000 Films To Change Your Life is something different, offering as it does not a rated list (how can one compare Raging Bull to A Night At The Opera anyway?) but one built around 'the nine emotions people are most likely to feel at the cinema' (p.6). Thus, there are chapters devoted to Joy, Anger, Desire, Fear, Sadness, Exhilaration, Regret, Contempt and Wonder, with a chapter slotted in early on entitled 'Food For Thought' which deals with the more cognitive side of cinematic output. Such an imaginatively organised volume, as the introduction proudly claims, can indeed 'be treated as you would a DVD: you can read it from start to finish, open it at random and dive in, jump from one part to another, make your own edit' (p.6). The only sticking point here is that not many DVDs lend themselves to jumping around without losing a sense of coherance, especially feature films! This rather pedantic point aside, 1000 Films To Change Your Life is an intriguing read, but ultimately a rather frustrating one, for it packs so much in there is very little breathing space or time to sit back and think about things. Thus, each chapter includes an overview of the cinematic emotion in question, a historical "grab-bag" of that emotion in specific films and a generous adult-sized portion of mini articles about various aspects of the emotion under scrutiny. The overall effect of this (even when dipping in and out of the book) is akin to navigating a vastly comprehensive breakfast buffet with pressure from hungry diners behind- there is so much to look at and so many different things to assimilate that you end up opting for just the toast and coffee after all. Although the sheer tapestry-like vastness of 1000 Films To Change Your Life is a trifle daunting, its coverage is to be applauded- it is guaranteed to make even the most ardent cinefile reach for their Halliwell's Film Guide (only to discover that a fair proportion of the films discussed are not listed in that weighty tome). With the Internet, however, this is not a problem, and can lead to the investigation of films, stars and directors prompted by the enthusiasms of those writing the mini essays. The hot 100-style list at the back of the book consists of largely familiar titles which are considered 'key' ones and are therefore priviliged a fuller reference, but, like the Channel 4 mainstay 'top 100' programmes, it does have some surprising inclusions and omissions. Consequently, there is no room for Frank Capra's It's A Wonderful Life but there is space for 1997's In The Company Of Men, for example. The complete film index at the very back of the book is likewise revealing in what was excluded in favour of what was included. Amusingly, Truffaut's classic Jules et Jim appears in no fewer than three of the emotion chapters (Joy, Desire and Regret) but the same director's equally masterful Les Quatre Cents Coups does not appear at all. Perhaps its chances were ruined by its indescribable charm and irrepressible creativity? (After all, neither charm nor creativity fits into any obvious emotion). This is one downfall of a book like 1000 Films To Change Your Life- that films not conforming to the 'cinematic emotion' prerequisite are overlooked in favour of those that crudely seek one particular emotion at the expense of others. Another problem for such a book is the ever-continuing nature of cinema, both in terms of new releases and past discoveries, as a film like Beyond The Rocks may change the life of a Valentino and Swanson fanatic in the way that Spider-Man (listed under 'Exhilaration' rather than 'Boredom' which was where I'd initally looked for it) surely would not. Finally, this last point highlights the thornier (yet unavoidable) problem that everybody is different, and the film that changes one person's life might well leave another totally unmoved. I was once told (prior to seeing the movie, I hasten to add) that It's A Wonderful Life would change my life. It did. As I left the cinema after the screening I would not, however, have described the emotion I felt as pure, undiluted 'Joy' (the emotion to which the film is firmly anchored to). Instead, my emotions in general ran riot- there was initial curiosity, hope, sadness, satisfaction and ultimately tears of relief, which I still cry each time I see the film. What I'm getting at here is that films are far more complex than just a pure emotion- they are works of art that are moulded and imbued with many varying feelings. In short, 1000 Films To Change Your Life is a laudable attempt to stimulate a more intelligent perception of perhaps the 20th Century's finest art form but, like those certain items in a breakfast buffet, should be taken with a pinch of salt. '100 Greatest Film Breakfasts' anyone? They might even interview Delia Smith about the morning meal in It Happened One Night- now that might be well worth watching. 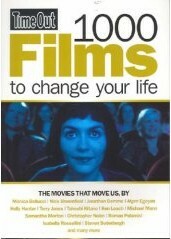 '1000 Films To Change Your Life' is published by Ebury Publishing.